‘The Thames Wunderkammer: Tales from Victoria Embankment in Two Parts’ is a new body of work produced as part of a public art commission on behalf of Tideway. London has outgrown its sewerage system. The capacities originally allowed for in the sewer network designed by Sir Joseph Bazalgette in the 1850s have been extended and now exceeded. The Thames Tideway Tunnel (scheduled for completion in 2022) will upgrade London’s sewerage system to cope with the demands of the city well into the 22nd century. 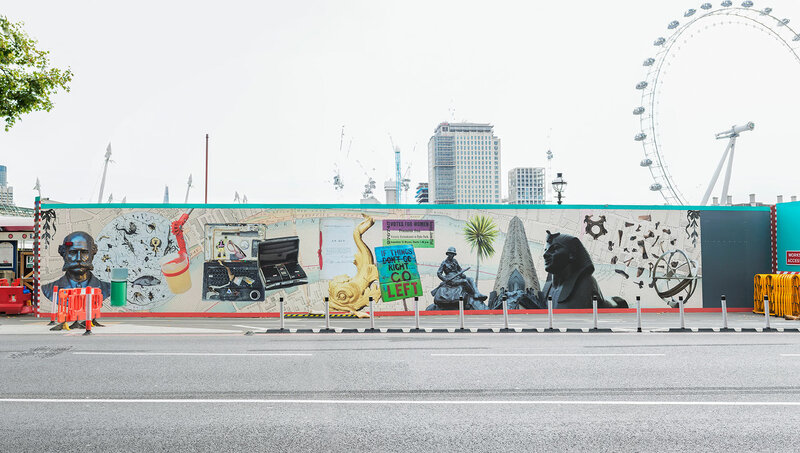 Tideway launched a new temporary art commission, to be located on the hoarding surrounding the Victoria Embankment Foreshore construction site, in central London; it is close to key central London landmarks, including the Houses of Parliament and Portcullis House, Hungerford Bridge and Whitehall Gardens. Responding to the rich heritage of the site, I’ve created a metaphorical ‘cabinet of curiosities’ along the two 25-metre foreshore hoardings. Modern terminology would categorize the objects included as belonging to natural history, geology, ethnography, archaeology, religious or historical relics, works of art and antiquities. The work is an aesthetic excavation of the area, creating an artwork that reflects the literal and metaphorical layering of the landscape, in which objects from the past and present are juxtaposed to evoke new meanings. Monumental statues are placed alongside items that are more ordinary; diverse elements, both man-made and natural, co-exist in new ways. All these components symbolise the landscape’s complex history, culture, geology, and development. The Thames foreshore is the longest archaeological site in London. Discoveries include: prehistoric archaeological remains at sites from Greenwich to Putney; Anglo-Saxon fish traps, the remains of Medieval, Tudor and Stuart jetties, re-used warship timbers, river defences, stairs, causeways, slipways, wharves, crane bases, bargebeds, drains and vessels, from throughout Greater London. The foreshore is also full of interesting artefacts, ranging from clay pipes and pottery fragments dating as far back as the Roman and prehistoric periods to flint tools, animal (and occasionally human!) bone, trading tokens and coins. You can download a pdf with more details of the project here. And visit the Tideway website with information about their art commissions here. 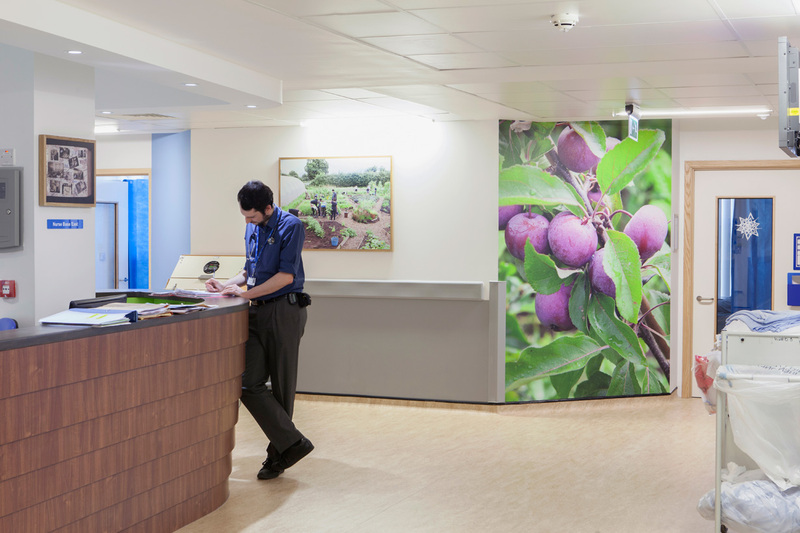 In 2012 I was commissioned to make a series of photographs that would help bring a sense of identity to acute inpatient departments within a major new hospital building in Bristol, UK. In response to this commission, I’ve created a new body of work reflecting the city’s culture, landscape and history. 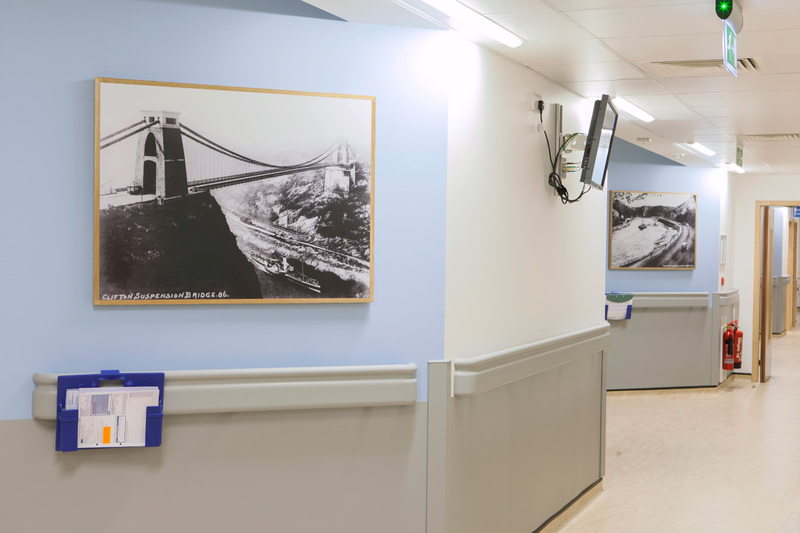 My final set of photographs have now been installed across seven floors within the new adult ward block and emergency department of the Bristol Royal Infirmary (BRI) hospital and are intended to enrich the hospital environment for patients and staff. The works follow the pattern of much of my previous studies, that is, photographs that deal with the relationship between landscape and people, and notions of identity and belonging. The final installed artworks explore the relationship that people living in the Bristol and South West have with their landscape, landmarks and pastimes, whilst depicting the multi-cultural and social diversity of the region. As is common with my practice I also added a collaborative element to the commission, offering the public an opportunity to participate directly with the project. I felt it was important to give the public an opportunity to help steer the project, given that the BRI is at the heart of Bristol’s community and that many people have an invested interest in the future of the hospital; be they former patients, current employees or visiting relatives. Throughout the commission I worked with hospital staff and the local community, whilst also collaborating with cultural partners including M Shed, the Bristol Records Office and Artshine. 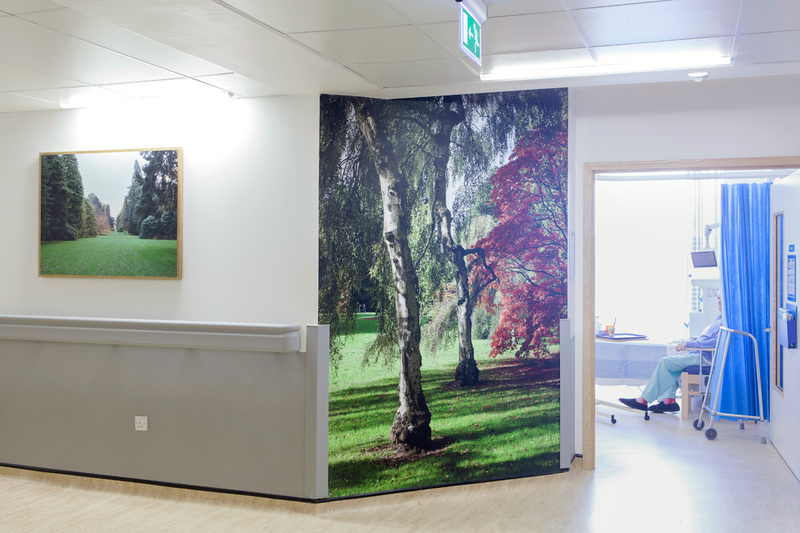 – Large-format framed landscape prints that reflect the unique culture, identity and interests of Bristol’s community that the hospital serves. – Alongside my own contemporary landscape scenes, I sourced historic photographs from the same locations to prompt memory for patients suffering with dementia. 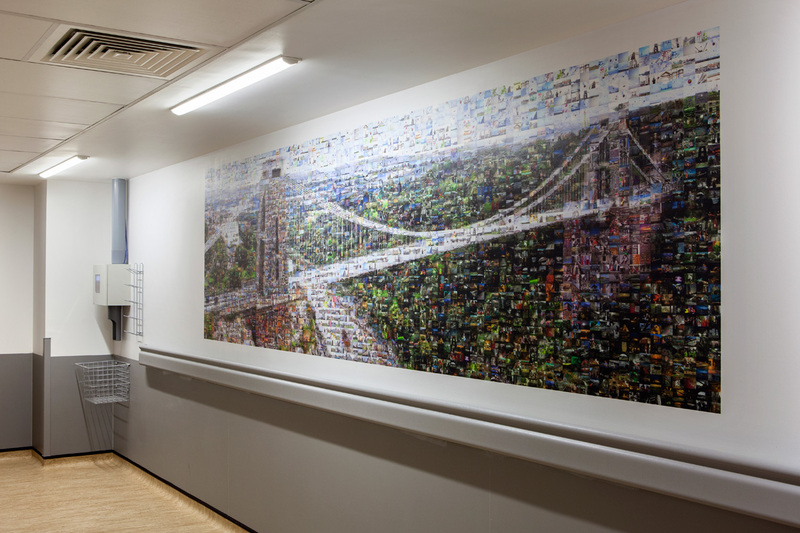 – ‘The Public Gallery’, a large five-metre collage based on a photograph I took of the Clifton Suspension Bridge, made up from over 2000 photographs submitted by the public. – A series of themed collage pieces made up of images submitted by the public. – Floor-to-ceiling ‘fauna portraits’ photographed in allotments and communal gardens sited within the vicinity of the hospital, along with images from Westonbirt National Arboretum. 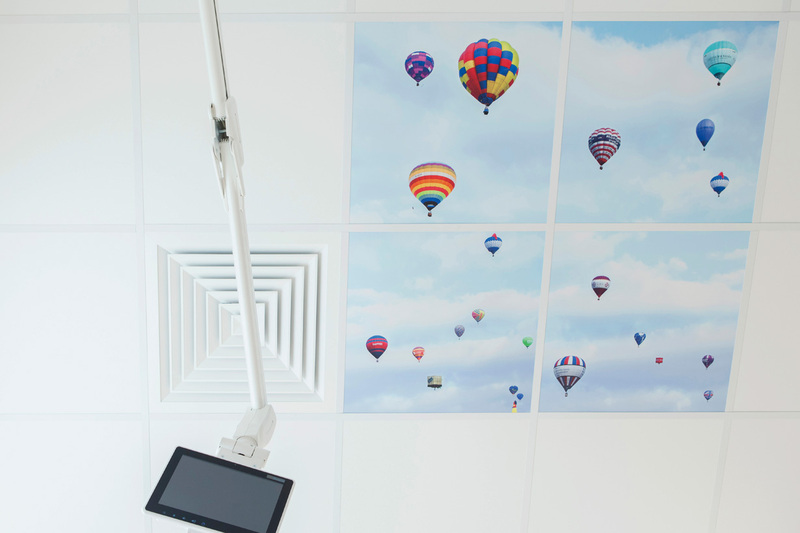 – Images printed directly on to ceiling tiles installed above ward beds featuring canopies of trees and hot air balloons photographed from the perspective of someone looking up. 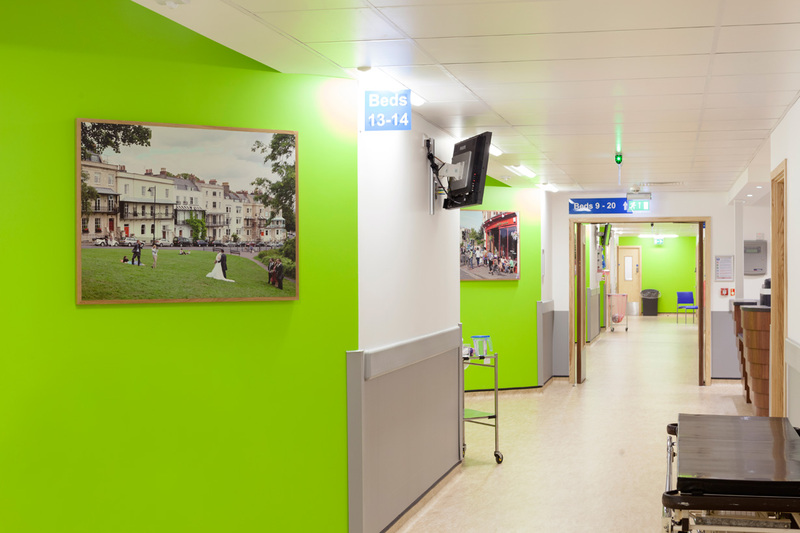 The project, commissioned by local hospitals’ charity Above & Beyond, was part of an arts programme for the BRI redevelopment, which consisted of a number of refurbishments and new builds for University Hospitals Bristol NHS Foundation Trust. I’ve recently completed an assignment for the New York Times T Magazine in Bhutan, which features on the cover of the current November 2014 issue (see above). 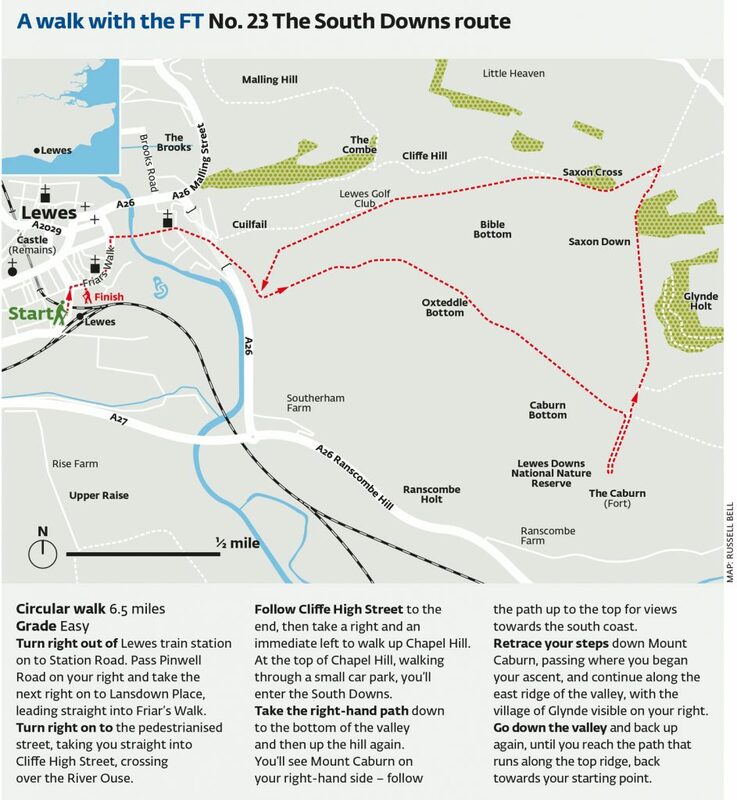 A recently took a walk with the writer Graham Swift on the South Downs near Lewes. The photographs appear in today’s FT Weekend Magazine alongside an article by Hannah Beckerman. You can download a pdf here. Here’s the walk in case you’d like to try…. I recently worked on a commission to create a print advert for Citizen’s first ever global advertising campaign (above). “Citizen Watch Co., Ltd embarks on a race against time in CHASING HORIZONS, the 84 year-old watchmaker’s first-ever global campaign that launches today. Created jointly by Wieden+Kennedy Tokyo and Amsterdam, Citizen’s first global campaign challenged photographer Simon Roberts and ex-NATO pilot Jonathan Nicol to chase the sunset across the Earth’s time zones. An integrated campaign, Chasing Horizons utilizes the imagery captured during the expedition in global print and digital executions. 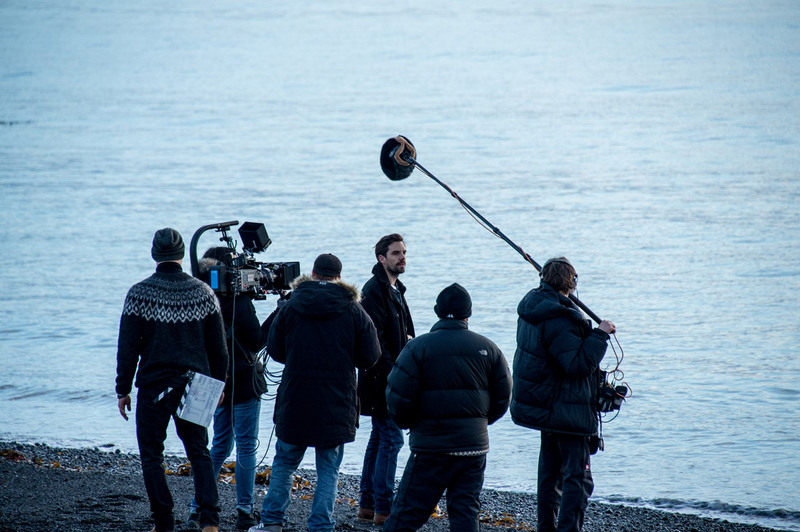 The short film (see below) by acclaimed documentary director, Tristan Patterson, portrays the story of the journey itself and is used for TV and online content. In a precisely planned window of time during late February 2014, when the days were still long but before the sun no longer sets, Simon and Johny undertook the mission. Setting off from Reykjavik in Iceland, they moved to a new time zone each hour; with Simon capturing the moment with a photo of the setting sun, while the Eco-Drive SATELLITE WAVE adjusted back to ensure they were living in the same hour. Flying in the opposite direction to the Earth’s rotation, they were able to stay in the same moment of time and experience the same sunset over and over again – but in a new location. The team continuously kept up with the sunset for one night before landing at their final destination in the Arctic Circle, with the mission ultimately resulting in a completely unique series of sunset imagery, taken at exactly the same hour and same minute, in the same day. Simon Roberts is creating a new body of work reflecting Bristol’s culture, landscape/urbanscape and history, including how these relate to Bristol’s hospitals. 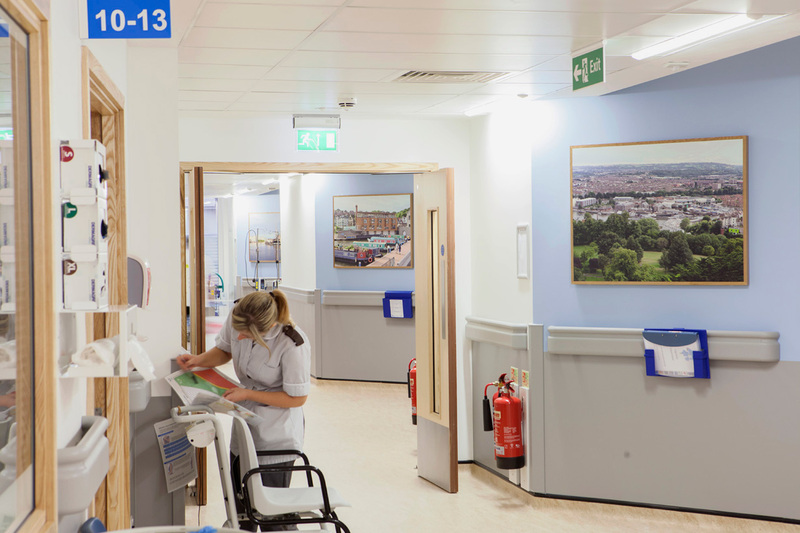 This work will form part of the arts programme for a redevelopment of the Bristol Royal Infirmary (BRI) for University Hospitals Bristol NHS Foundation Trust, which features both refurbishment and new building. For this project, he will engage with both the hospital and local community and collaborate with cultural partners, including M-shed, Artshine and Ffotogallery. 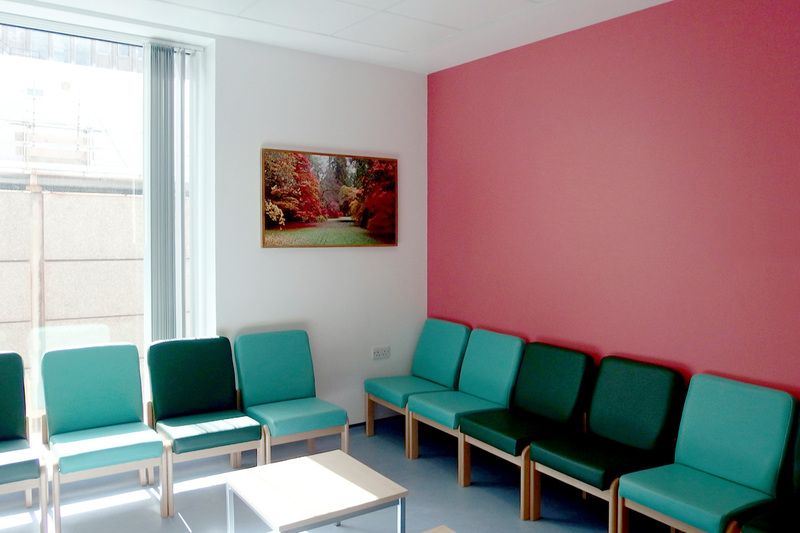 It is due to be completed by August 2014 to fit in with the opening of a new ward block as part of the redevelopment. 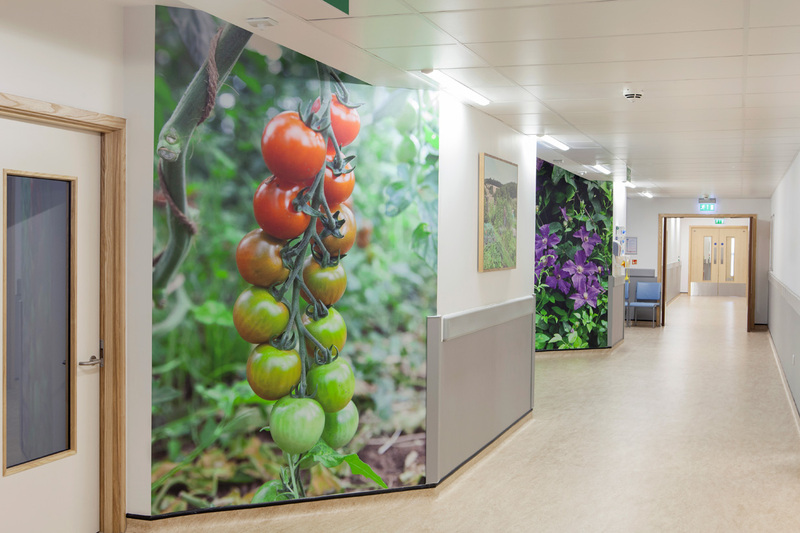 This commission has been funded by Above & Beyond, the Trust’s charitable fund, which is funding artworks to create a nicer environment for staff and patients in key patient and public areas across the development. More information on the commission can be found here.